Welcome to 2016. This is a big year for American politics with another presidential election on the horizon. I’ve probably never been as disenchanted with the political process or the rhetoric of politics as I am this cycle, though it’s possible that I feel that way every time. Still, while I’m pretty pessimistic about American politics, I’m not pessimistic about life in general. I’m not worried because I trust in a God who reigns over the whole stream of human history and who is able to raise up and tear down both kings and nations. And so while I’m interested in what is going on in politics, I have bigger concerns. I probably won’t be blogging much about politics this year. I have better things to think about, like the writings of Dietrich Bonhoeffer. Dietrich Bonhoeffer lived in a time when politics played a huge role in human history. He lived during the time of Nazi Germany. He was involved in the underground “confessing church” and even in a political (failed) plot to assassinate Adolf Hitler. He understood more than most the role that the theology and the church played in politics and he paid for his convictions with his life, executed just days before the camp in which he was being held was liberated by Allied troops. Yet, despite the fact that Bonhoeffer lived at such a crucial time in history his writings, at least the books which I have read, are not consumed with the political musings. Instead, he writes about theology. He writes about discipleship. He writes about community. He writes about Christian ethics. He writes about topics which are edifying to the church universal in every day and age. He wrote to the church and for the church, bringing the truth of the Word of God to bear on those who would take up the task of following Jesus. One such book, Life Together, is an exploration of Christian community. In this post I will be summarizing portions of Chapter 1 of that book. For sake of summary, I have constructed this post a little differently than Bonhoeffer constructed his chapter. Here are three dangers which Bonhoeffer sees as damaging to Christian community. Loving the ideal more than the actual: Bonhoeffer begins his exploration of Christianity by rooting the reality of Christian brotherhood in the work of Christ for us. “What determines our brotherhood is what the man is by reason of Christ. Our community with one another consists solely in what Christ has done to both of us” (25). Our Christianity community is always no more nor more less than this. “One who wants more than what Christ has established does not want Christian brotherhood. He is looking for some extraordinary social experience which he has not found elsewhere; he is bringing muddled and impure desires into Christian brotherhood. Just at this point Christian brotherhood is threatened most often at the very start by the greatest danger of all, the danger of being poisoned at its root, the danger of confusing Christian brotherhood with some wishful ideal of religious fellowship, of confounding the natural desire of the devout heart for the community with spiritual reality of Christian brotherhood” (26). “He who loves his dream of community more than the Christian community itself becomes a destroyer of the latter, even though his personal intentions may be ever so honest and earnest and sacrificial” (27). You don’t have to be around the church long to see how great a danger this can be. As much as you might love your particular church family, it will never live up to the “ideal of Christian community.” But God doesn’t give us some ideal, at least not the one in our imagination. Instead, he gives us a community of people reconciled to God in Christ and tells us to love that. Relying on human love instead of spiritual love: Next Bonhoeffer draws a distinction between “human love” (which he calls a “psychic reality”) and “spiritual love.” He defines the distinction this way: “The basis of all spiritual reality is the clear, manifest Word of God in Jesus Christ. The basis of all human reality is the dark, turbid urges and desires of the human mind” (31). Human love is that love which relies on natural human affections and for Bonhoeffer it is not always evil in and of itself. It can exist quite naturally in devout men. But when this natural human affection becomes the basis for Christian community, even amongst devout men with the best of intentions, “the result is to dethrone the Holy Spirit, to relegate Him to a remote unreality” (32). Human love can only take you so far. It enables you to love your friends and those who are like you but that is all. Human love turns to hatred when that love is not reciprocated or when it is rebuffed. It will not allow you to love your enemy. A Christian community which relies on this human love as the basis of its existence fails theologically – it is dethroning the work of the Holy Spirit (see quote above) and it is denying the work of Christ, which is the actual basis for Christian community. It also fails practically. The Christian community which relies on human love, on natural affections, will necessarily be divisive, both towards those outside the church, and even within the community itself as factions form around personal preferences or as disagreements and slights go unaddressed and unforgiven. Seeking direct access to another instead of access mediated through Christ: Most dangerously for Bonhoeffer, though, is that human love seeks to have direct contact with another soul. This is one of the most interesting and unique elements of Bonhoeffer’s theology which I have come across. It shows up in both Life Together and The Cost of Discipleship. The basic principle is that Christ is our mediator. He is our mediator between us and God. And, for Bonhoeffer, he is also the mediator between us and everyone else. Or at least he should be. We shouldn’t seek to have direct access to another soul, only access that is mediated through Christ. What he means, I think, is that we are always interacting with people in relation to Christ. What does it look like for someone to seek direct access to another person, not mediated through Christ? Direct human love wants to possess. It wants that person for its own sake. “It wants to gain, to capture by every means; it uses force. It desires to be irresistible, to rule” (34). This kind of love makes truth relative. It only uses truth in order to gain its ends, the affections of the other. It is ultimately coercive, even if it is not self-consciously so. “Human love constructs an image of the other person, of what he is and what he should become. It takes the life of the other person into its own hands” (36). When direct access to another soul is desired, the weak are overcome by the strong. Manipulation rules the day. “Because Christ has long since acted decisively for my brother, before I could begin to act, I must leave him his freedom to be Christ’s; I must meet him only as the person that he already is in Christ’s eyes. This is the meaning of the proposition that we can meet others only through the mediation of Christ” (36). This sort of love speaks the Word of God to a brother, either a word of encouragement or warning or instruction, and then releases that person to Christ. It does not seek to control or coerce or manipulate. Human/direct love is always a danger to Christian community since it desires to possess the other when the other really belongs to Christ. This unhealthy desire manifests itself in many ways – a desire to be liked and admired, jealousy, manipulation, failure to speak the truth, etc. All of these are the “fruits of the flesh” and stand in opposition to the fruit of the Spirit (see Galatians 5). Solution – Applying the gospel to the Christian community: Bonhoeffer’s basis for Christian community provides a solution to all of these problems. His solution is to apply the gospel to Christian fellowship. Bonhoeffer reminds his readers that we must view others in Christian community as they are objectively in Christ and then relate to them through Christ. It is this objective reality which forms the basis of Christian fellowship. We really are one in Christ and our unity is based on him alone. If we give God thanks for this objective reality, we will appreciate all the more the subjective experience that fellowship believers brings. “The more clearly we learn to recognize that the ground and strength and promise of all our fellowship is in Christ alone, the more serenely shall we think of our fellowship and pray and hope for it” (30). This entry was posted in Doctrine, Uncategorized and tagged Bonhoeffer, books, Christianity, Church, Life Together, Theology on January 4, 2016 by stevenkopp. This Sunday I started a class on the Kingdom of God. 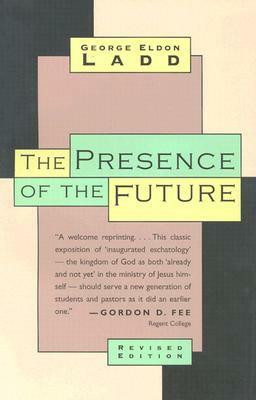 I was originally planning on doing a class on the End Times but, in my initial research, I was directed by a professor to read The Presence of the Future by George Eldon Ladd. I understand why I was directed to this book – understanding what Jesus meant by the Kingdom of God is foundational to understanding the End Times. However, it’s also foundational to a lot of other things, like the mission of the Church, the present work of God in the world, and what it means to live in the tension between the resurrection and the consummation of all things. And so, while I originally intended to do a class on the End Times, I punted that to the Senior Pastor, John, and decided on an equally difficult and confusing topic; the Kingdom of God. Since the class is only being offered to a subset of our church (it takes place during the post-sermon discussion time) I have decided to post summaries of each week’s lesson. “The Kingdom of God” or “The Kingdom of Heaven” are concepts which were central to John the Baptist’s (Mt 3:2), Jesus’ (Mt. 4:17, 23; Mk 1:15; Lk 4:43; Acts 1:3), and Paul’s (Acts 19:8, 28:23, 31) teaching. Even so, we do not find in the Gospels any “definition” of the Kingdom. Instead, we see the language of the Kingdom used in diverse and sometimes apparently contradictory ways. Instead of a textbook response from Jesus, we get parables which describe the Kingdom without defining it. One of the biggest questions about the Kingdom is whether it is something which we can already experience, or whether it is something which is yet to come. On the “already” side of things we have verses like Luke 11:20 “But if I drive out demons by the finger of God,then the kingdom of God has come upon you,” and Luke 17:20-21 “Once, on being asked by the Pharisees when the kingdom of God would come, Jesus replied, “The coming of the kingdom of God is not something that can be observed, nor will people say, ‘Here it is,’ or ‘There it is,’ because the kingdom of God is in your midst.” In these verses, the Kingdom appears to be a present reality. On the “not yet” side of things we see instances where “Kingdom of God” is used interchangeably with “eternal life” (Matthew 19:16-24), the judgment (Matthew 7:21-23), or as a contrast to hell (Mark 9:47). In these, and other instances, the Kingdom seems to be a future realm which people can either enter, or fail to enter, based on their response to God. This diverse usage of “Kingdom of God” language has historically caused theologians to choose between understanding the Kingdom as a future age to come or as a present spiritual reality. There is merit in both viewpoints and theologians from both camps ask important question. However, there are dangers on both side of the spectrum. The biggest problem for both views is that they struggle with interpreting the passages that seem to contradict their position. For instance, those who focus on the “already” aspect of the Kingdom have to view Jesus’ apocalyptic sayings as a literary device used to draw the reader to some ethical conclusion. On the other hand, those who focus on the “future” aspect of the Kingdom tend to come to the conclusion that in passages like Luke 11:20 and 17:20-21 Jesus only meant that the “signs” of the Kingdom were present, but not the Kingdom itself. There are implications for the ministry of the Church as well. Too much of a focus on the present reality of the Kingdom lead churches to believe that their mission is to “build” the Kingdom, or bring the benefits of the Kingdom to earth, and devalue the simple proclamation of the Kingdom. In other words, they tend to overestimate the role of the Church in regards to the Kingdom. On the other hand, those who view the Kingdom as only a future reality tend to view the world, and the role of the Church, in far more pessimistic light. If God’s actions are so limited in history, the only hope is for a cataclysmic event to take us out of history. In the meantime, the only mission of the Church is to wait to be saved out of this world and call others to enter the Kingdom. First, the Jesus’ coming fulfilled God’s promise of the Kingdom in His very person. But this initial coming of the Kingdom was a mystery. It was an unexpected, but nevertheless real, manifestation of the reign of God. This coming of the Kingdom, while a fulfillment of the promise, was not the final consummation of the promise. Second, the realities of the Kingdom, inaugurated in Jesus, are present now through the work of the Holy Spirit. Third, when Jesus returns we will see consummation of the Kingdom. We will see the Kingdom, the reign of God, in its fullest form. I have attached two resources for anyone with further interest. First, I have listed the usages of “Kingdom” in the Gospels and Acts (pdf) as a source of further study. Second, I have attached my power point presentation from this Sunday. This entry was posted in Doctrine and tagged Christianity, kingdom of god, kingdom of heaven, Theology on October 13, 2013 by stevenkopp.